The recent images of Fianna Fáil leader Micheál Martin and SDLP leader Colum Eastwood standing side by side in Belfast, to announce plans of a new "partnership" proved to be a damp squib. 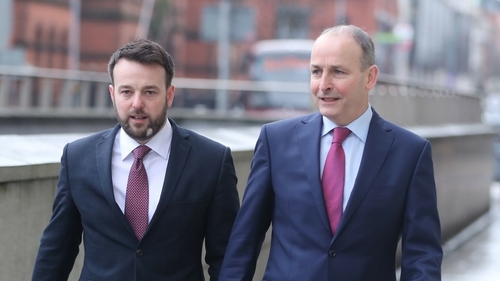 Following years of flirtation, together with intensive behind the scenes negotiations regarding a potential Fianna Fáil-SDLP merger, Martin and Eastwood made the less than dramatic declaration that the two parties were "not talking about a merger, we are talking about a partnership". The long awaited news that the anticipated Fianna Fáil-SDLP merger had now turned into a "partnership" caught most politicians and political commentators off guard. For over a decade now, reports have emanated from within Fianna Fáil that a possible merger with the SDLP was on the cards and that it was only a matter of time before a formal alliance was completed. Fianna Fáil’s support for a formal alliance with the SDLP must be viewed within the context of former Fianna Fáil leader and taoiseach Bertie Ahern’s decision in 2007 to remodel his party on an all-Ireland basis. Fianna Fáil, Ahern proudly pronounced, had two central objectives. In the medium-term, his party would seek to contest local county council and Northern Ireland Assembly elections. In the long-term, Fianna Fáil would work hard to achieve its ambition to secure a united Ireland. Ahern’s decision was in response to the signing of the St. Andrews Agreement in 2006. Although devolution of policing and justice powers to the Northern Ireland assembly remained unresolved, the DUP and Sinn Féin took the momentous decision in the aftermath of the Agreement to enter a power-sharing executive with one another. In early December 2007, Fianna Fáil commenced its first recruitment drive in Northern Ireland in almost 70 years, with the establishment of two "political societies", namely the William Drennan cumann at Queen’s University Belfast and the Watty Graham cumann at Magee campus of the Ulster University, in Derry. In the same month, Fianna Fáil successfully registered with the UK Electoral Commission as a Northern Ireland political party. Two years later, under Ahern’s successor as party leader and taoiseach Brian Cowen, Fianna Fáil officially formed its first forum in the constituency of Downpatrick, South Down. Two further Fianna Fáil constituency fora soon followed in Crossmaglen, South Armagh and Fermanagh South Tyrone. A year later, Cowen visited Crossmaglen to officially open a Fianna Fáil office in the town. At the time, Fianna Fáil’s proposed extension across the border raised expectations of a formal merger between the party and the SDLP. Many within the SDLP saw such a coming together as helping to reinvigorate an organisation that over the previous years had fallen into poor political health. Like their political opponents, the Ulster Unionist Party, the SDLP found themselves marginalised by the polarisation of Northern Ireland politics. "After having its clothes stolen by Sinn Féin", reported The Guardian in 2009, the SDLP was faced with the prospect of either joining forces with Fianna Fáil or possibly fading into the political abyss. In a 2007 interview, then SDLP leader Mark Durkan acknowledged that a large section of his party’s members might possibly welcome the prospect of a formal merger with Fianna Fáil. Although Durkan was personally against such a merger, there was reportedly strong support for the proposal from within the SDLP. As one source noted, according to Martina Purdy then with the BBC, "Labour might be our sister party, but Fianna Fáil is our brother". Indeed, at the 2007 SDLP party conference, a commissioned poll of SDLP delegates revealed that a large majority backed a formal coalition with Fianna Fáil. Margaret Ritchie’s election as SDLP leader in February 2010 immediately ruled out the prospect of a formal Fianna Fáil-SDLP merger. With the Republic of Ireland in the middle of a major recession and the Fianna Fáil government blamed for much of the economic hardships, it was altogether unsurprising that Richie sought to distance herself from her predecessor’s comments. Speaking at the Irish Labour Party conference in April 2010, Ritchie maintained that there would be no alliance with Fianna Fáil on "my watch". A similar theme emerged under the leadership of Dr Alasdair McDonnell during his four years in the post from November 2011 to November 2015. Given McDonnell’s commitment to unify and reinvigorate the party by "putting more votes in the SDLP ballot boxes" and gaining more ministries in the 2016 Northern Ireland Assembly election, the prospect of a formal Fianna Fáil-SDLP merger was shelved. Indeed, on Micheál Martin’s appointment as leader in 2011, the prospect of a formal Fianna Fáil-SDLP merger was ruled out indefinitely. Fianna Fáil’s humiliating relegation to the opposition benches meant that there were very few resources, or indeed appetite, to continue with Bertie Ahern’s one-time master project of remodelling the party on an all-Ireland basis or entering into a formal alliance with the SDLP. Martin argued that Ahern and Brian Cowen (particularly the former) were far too quick to announce their desire to establish Fianna Fáil in Northern Ireland, without actually giving this policy due consideration. However, the story does not end there. In 2014, Martin again raised the prospect of Fianna Fáil contesting elections in Northern Ireland in the near future. Addressing delegates at the party ard fheis in Killarney, Martin confirmed reports that Fianna Fáil might consider running candidates in elections across the Irish border in 2019. Reports in the media in August 2018 suggested that a formal Fianna Fáil-SDLP merger was imminent, with the expectation that the two parties would stand on a joint platform for local and European elections in spring 2019. But the recent announcement of an "unprecedented and historic" partnership is a definite retreat from more grandiose plans for a formal merger between the two parties. Martin has instead sought to downplay Fianna Fáil’s plans to remodel the organisation on an all-Ireland basis. Rather than committing to a formal alliance, he has instead spoken of a desire to "assist" the SDLP in forthcoming local Northern Ireland elections, with a pledge that his party will "bring extra capacity" to the SDLP during the campaign. Not everyone within the SDLP has welcomed news of a new Fianna Fáil-SDLP partnership. In an interview with The Irish News, former SDLP deputy leader Bríd Rodgers explained that this new alliance would invariably dilute the SDLP’s "social democratic principles". Indeed, there is a fear within certain SDLP circles that such a partnership will merely foster resentment within an already polarised political landscape in Northern Ireland and thus have a negative impact on the task of promoting reconciliation on the island of Ireland. Why have Fianna Fáil and the SDLP now decided to form a partnership? Moreover, many within the SDLP feel uncomfortable aligning themselves too closely to "only one party" in the Republic of Ireland, to again quote Rodgers. The two other major constitutional nationalist parties in the Republic of Ireland, Fine Gael and the Labour Party, have traditionally promoted a non-sectarian, anti-physical force policy vis-à-vis the Northern Ireland conflict. Thus, a vocal minority of SDLP supporters have questioned Colum Eastwood’s decision to throw all the SDLP’s apples into the Fianna Fáil basket. Why have Fianna Fáil and the SDLP now decided to form a partnership? The obvious answer is that in the context of Brexit Fianna Fáil feels threatened by the growing electoral strength of Sinn Féin on the island of Ireland. Martin, therefore, views Fianna Fáil’s potential entry into Northern Ireland as a useful policy in his battle with Sinn Féin for the hearts and minds of the electorate in the Republic of Ireland. For the SDLP, the answer is more clear-cut. Eastwood realises that the SDLP is gradually fading into the political twilight with the continued polarisation of the political boundaries in Northern Ireland. Thus, the announcement of the SDLP’s partnership with Fianna Fáil is a desperate attempt to resurrect the party’s identity as the custodians of constitutional nationalism in Northern Ireland.